I never thought I would enjoy making cakes! My aunt made cakes using ricotta, an ingredient widely used in cake making in Italian recipes. The story of this cake is really about how easy it is to make, no more than 15 minutes. When I started I was going to use a plain round tin (you will see in the photo with all the ingredients), but I changed my mind at the last minute when my new Kugelhopf Bundt tin ordered online arrived! I just had to use it for the first time and the cake turned out looking great. I was very happy with the result. Try it, you will love it. Want to learn more about Italian cakes? Explore our authentic Italian cooking classes in Melbourne! 300 gr of good quality ricotta, drain in the refrigerator for a few hours if there is water in the container. Icing sugar to dress the cake. Warm the oven to 180° centigrade, make sure your oven is warm enough. 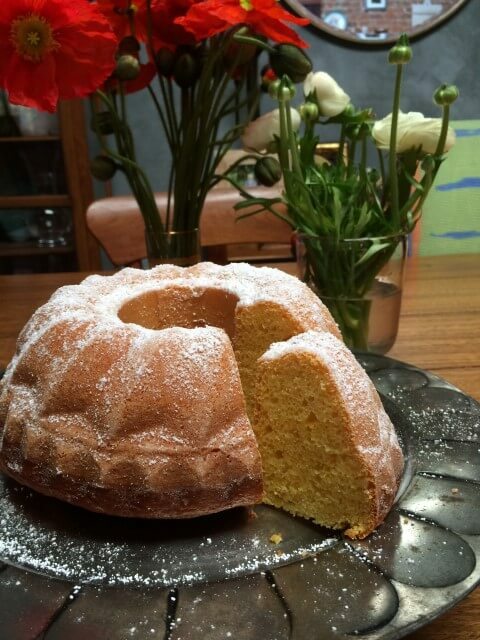 You will need a 22 cm Bundt cake tin, you can also use a round cake tin if you prefer. Generously butter the cake tin and sprinkle with flour to coat the tin thoroughly. In a bowl, soften the ricotta with a spatula, add the sugar and using a hand held mixer at low to medium speed, whisk the sugar with the ricotta until the sugar is incorporated with the ricotta and you have achieved a soft cream consistency. In a separate small bowl beat the eggs and add them to the cream mixture, amalgamate the eggs with the ricotta cream with the mixer at the same low speed, a few minutes, you can do this with a spatula if you prefer. Add all the wet ingredients: the orange and lemon juice, the saffron milk and powder, the orange and lemon zest, the vanilla paste, the salt. Mix all the ingredients together with a spatula until well amalgamated and thoroughly mixed through. In a separate bowl sift the flour together with the baking powder. Start pouring the flour into the cream mixture and gently continue incorporating with the mixer at low speed, add the flour a little at a time, in three to four batches. The process will take less than 5 minutes. Bake in the warm oven for 1 hour (do not open the oven door during the first 30 minutes) after 30 minutes check the cake, the tin may need turning in the oven. It will need another 20 to 30 minutes cooking, depending on your oven. Test the cake is cooked at the 40 minutes mark by inserting a toothpick in the centre. When the toothpick comes out clean the cake will be ready. When done remove from the oven and allow it to cool in the tin for 10 minutes, remove from the tin and transfer to a serving plate. Sprinkle liberally with icing sugar. It will keep very well for over a week.